Clear glass, one crisp bitten virginal apple and a cult following to rival a pop star. Steve Jobs, the late co-founder of Apple, Inc. was a renowned stickler for design. There was no way he would retail his beautiful phones, computers and ‘haute couture’ tech gadgets in a shoddy showroom. While the majority of the showrooms exist in malls in a minimalistic steel-and-glass décor, Apple’s flagship stores have won numerous architectural awards, especially the one located on Fifth Avenue in midtown Manhattan, New York City. This particular one, open 24/7, 365 days of the year, has an iconic glass cube structure, which was completed in 2006 and revisited in 2011 to the reported cost of $7 million and $6.7 million respectively. The glass panes were replaced and fitted with larger ones to reduce the number of visible seams…because only one company in the world would care that much about judging the product by its display area. Glass cubes, glass stairways with engineered precision, round glass elevators, glass bridges…and an inverted glass pyramid for the one at the Louvre; it is obvious that Apple loves the clarity and simplicity of glass. It’s as if Jobs wanted to provide a see-through looking glass to his products; a pedestal or shrine to the revered goods that should clearly be visible to anyone passing by. And there are many, who come to stare, openmouthed at the larger-than-life stores. The one on Fifth Avenue, for instance, is one of the most-photographed structures in the city, which is saying a lot! Despite the reverence towards steel and glass, you wouldn’t be hard-pressed to find instances where the Apple stores utilise and work around the aspects of the buildings’ original architecture – as seen when it maintained the romanticism of Paris in its Opera store. Travelling the world with Apple: from 40,000 square feet of retail space in London; a huge, offset stainless steel frame holding the iconic glowing apple logo in Beijing; rooftop grass with a skylight visible to surrounding buildings in Boston; a big steel tunnel in Chicago; and a towering glass cylinder and spiral stairway in Shanghai, we arrive at Apple’s Grand Central Station store, which wraps around the station’s terminal from a balcony position, making it one of the largest Apple stores in the world. And while it’s not a big deal to open a store in a mall or an airport, evidently you need to be the cat’s whiskers to be given access to the Carrousel du Louvre, the underground shopping area in Paris, where the inverted glass pyramid is now as much of a talking point as Dan Brown’s imagination. 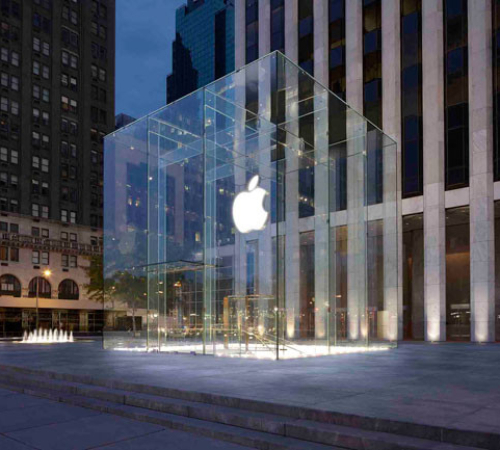 While the architectural firms Bohlin Cywinski Jackson (BCJ) and more recently, Foster + Partners have a heavy hand in the engineering and designing of the stores, Apple has patented or filed patents for their most original designs, such as the cube and the cylinder. Steve Jobs’ name is listed first on those patents. There is even a technical patent for the engineering behind the complex glass and hardware system. Last year, in an effort to drive the success post Jobs’, the current CEO, Tim Cook, hired Angela Ahrendts, the person behind Burberry’s transformation into a symbol of global luxury. She’s been busy reshaping Apple’s physical and online retail efforts so that they both achieve a parallel cult status. Steve Jobs masterminded the concept of retail and brand experience, hiring people specifically to drive this strategy. The high-profile retail stores, developed by Jobs, the Apple retail team, designers Eight Inc., architects Bohlin Cywinski Jackson and structural engineers Eckerlsey O’Callaghan have become among the most recognised brand expressions in retail. In fact, the one at Fifth Avenue beats Saks, Best Buy and Tiffany & Co by a mile in sales per square foot per year. With the ‘Genius Bar’ concept, customers can set-up their products or receive technical advice, while the chic stores create a sense of sharp intellectualness – a person breezing in would automatically feel part of an elite and clever gang. After all, Apple could be credited in part with making smart, cool. Ever seen the lines in front of American booksellers before the next Harry Potter installment was due? Apple store openings have it bad. Followers and Apple-lovers (they exist in drones) line up early in the morning or even the night before to watch history being unveiled in their town. Some have more mercenary desires like the potential giveaways. The recent Apple store opening in Istanbul promised the first 4,500 entrants free T-shirts. Three thousand shoppers waited in line for the opening of Apple’s Sydney store in 2008. Alternatively, outraged Chinese Apple fans threw eggs at the Apple store in Beijing after sales of the iPhone 4S were cancelled! Wonder what is likely to happen when an Apple flagship store hits the mean streets of Mumbai?